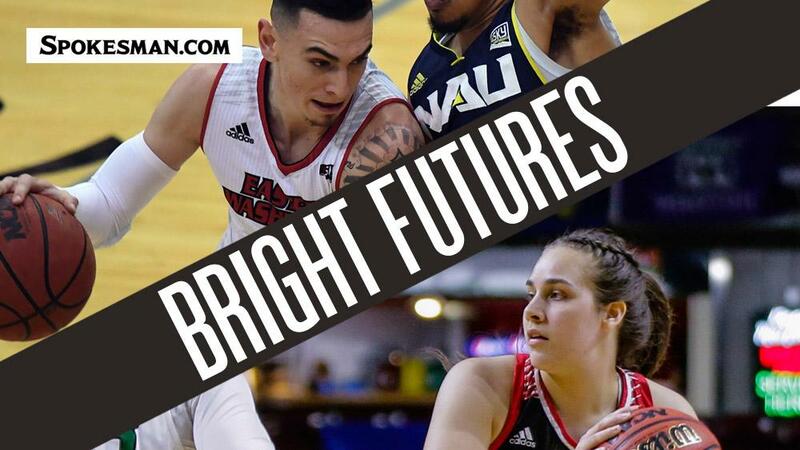 The return of Jacob Davison, top, and Jessica McDowell-White will give Eastern Washington men’s and women’s basketball teams plenty to be excited about next season. Despite reaching their respective Big Sky Tournament title games, Eastern Washington’s men’s and women’s basketball teams didn’t get as much as an invitation to the pay-to-play College Basketball Invitational or the CollegeInsiders.com Tournament – the lowest, most obscure rungs of March Madness. The Eagles’ deep tournament runs in Boise last week – the first time both programs reached the Big Sky championship game in the same season – didn’t equate to winning records. Between injuries, nonconference gauntlets and enigmatic Big Sky play, the EWU men (16-18, 12-8 Big Sky) and women (13-20, 9-11) didn’t reach their desired win-loss aesthetic. In a one-bid conference like the Big Sky, though, a week of good basketball in early March can define a season. See, for example, Eastern Washington, which got hot at the right time. EWU, the third-place squad from the 11-team Big Sky men’s standings – won 13 of its last 19 games. The EWU women, who finished sixth, won nine of their last 15. Each returns enough depth and firepower to build off its late-season success. EWU’s men will miss the services of All-Big Sky second-team forward Jesse Hunt, an Australian who boosted the Eagles in a variety of capacities (14 points, 8.6 rebounds and 3.3 assists per game). It will also miss the torrid 3-point shooting of Ferris graduate Cody Benzel, who hit 16 3-pointers in his last five games. But EWU returns senior forward Mason Peatling (All-Big Sky second team), junior guard Jacob Davison (All-Big Sky third team) and athletic sophomore swingman Kim Aiken Jr. (All-Big Sky Tournament team) and that instantly gives the Eagles one of the most talented rosters in the conference. Davison (15.2 ppg) missed the last 10 games last season and Peatling missed the nonconference schedule this year with lower-leg injuries. EWU was also counting on ex-Richland star guard and BYU transfer Steven Beo, who registered only a few minutes because of an injury and opted to apply for a medical redshirt. Luka Vulikic, a 6-foot-7 guard who started half the season, also missed the last 10 games of the season with an injury. He has opted to transfer, according to head coach Shantay Legans. The guard-heavy, deep-shooting Eagles also return 5-9 sparkplug Tyler Kidd (9.9 ppg, 3.1 apg), a starting point guard who was key in the Eagles’ late-season surge. Jack Perry, who has also been a fixture in EWU’s backcourt, also returns at point guard after starting 11 games last season. Shadle Park alum Tanner Groves, a 6-8 inside and outside threat, could help fill Hunt’s void after a promising redshirt freshman season off the bench. With the addition of a recruiting class headlined by Boise product Ellis Magnuson – a crafty 6-1 point guard expected to make an immediate impact – the Eagles will be primed to make the next step in Year 3 of the Legans era. Legans, 37, has won more games than he’s lost (36-31 overall, 25-13 Big Sky) during his first two seasons. He is 4-2 in the Big Sky Tournament, both losses to rival Montana in the title game. “To play without a couple of players hurt us during the year, but it’s next man up,” Legans said. “That’s how we do it at Eastern – you are always fighting to the very end. EWU’s women were minutes away from securing the program’s first NCAA Tournament berth since 1987 before they fizzled down the stretch in a 61-59 title game loss to Portland State last week. If EWU wants to end that drought, it will first have to make up for the production and leadership of two-time All-Big Sky selection Violet Kapri Morrow (18 ppg, 6.5 rpg), who finished her career among the school’s top career scoring leaders. Sure-handed point guard Alissa Sealby (9.5 ppg) also graduates after starting all 33 games last season. EWU returns one of the better groups of underclassmen in the league last season in guards Jessica McDowell-White (8.5 ppg, 3 apg, All-Big Sky Tournament team), Grace Kirscher (10 ppg, All-Big Sky honorable mention), Brittany Klaman and post Bella Cravens. The Big Sky’s “Top Reserve” last season, Uriah Howard (7.6 ppg), will likely start next season to help make up for the void of Morrow’s scoring. Howard and 6-3 forward Leya Depriest (10 starts last season) will both be seniors, along with 5-11 guard Andie Easley, a Hawaii transfer who played in conference games after recovering from a series of leg injuries. Published: March 20, 2019, 5:47 p.m. Updated: March 20, 2019, 7:02 p.m.